Paul Hunt's Commercial Electrical Contractors can provide full consultancy and guide you through the technical and legislative issues to ensure that the electrical installation meets all compliance requirements. Our team of commercial electrical contractors have extensive experience in dealing with all aspects of Industrial Installations. We understand the pressures facing any business when carrying out refurbishment work. Our team works efficiently and ensures you are kept up-to-date with the project whilst carrying on as usual. Our service offers the full scope of work from consultancy and design, to installation. Our registered contractors have extensive experience in all manner of industrial and commercial electrical environments. Whether it’s a car showroom, school, factory or property development, we are fully prepared for the task. Firstly, we will guide you through all the technical and legislative issues you must consider when preparing for your installation. No matter the size of a company, systematic planning is essential. Considering the negative consequences that can derive from poor electrical installations, poor planning can be just as detrimental to your business. Our experienced team will ensure that there is minimal impact on your business and as little downtime as possible. With comprehensive schematics, you can be assured that all requirements and goals are covered. 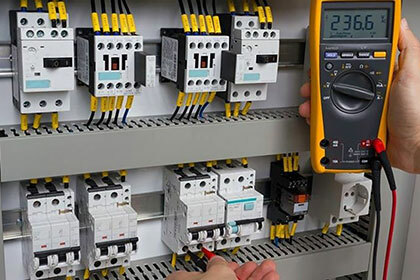 Whether it’s a new commercial electrical installation or refurbishment of an existing system, it’s essential to manage the project effectively. Communication is key. Therefore, we ensure that we keep you up-to-date whilst enabling you to carry on…Business As Usual! Our highly-skilled team takes the stress out of dealing with multiple contractors at different times. Our team of commercial electrical contractors work efficiently together and proactively tackles any issues. In essence, we keep you in the loop without taking up your valuable time. Our team has extensive experience working with new and old installations of low voltage, single and multicore wiring. We have experience in large-scale industrial and commercial electrical installations. Whether mains, single or 3 phase electrical power systems, we have specialist commercial electrical contractors to handle any installation. In a rapidly changing technological world, together with the ever-increasing regulation, it is becoming difficult for any business to keep up with their obligations.